This weekend, a friend and I made what has become an annual trip to Southern Nevada. Normally, we just stay around Vegas for 2-3 days, but we decided to venture a bit further this year. 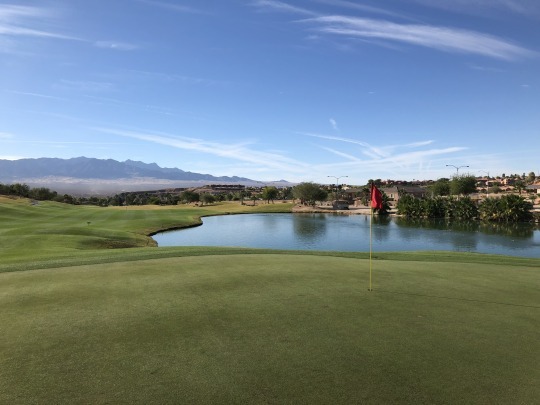 That was partly for me, since there’s only one public course in Vegas that I have left to play and it wasn’t quite in our budget. Hint: it rhymes with Schmadow Creek. 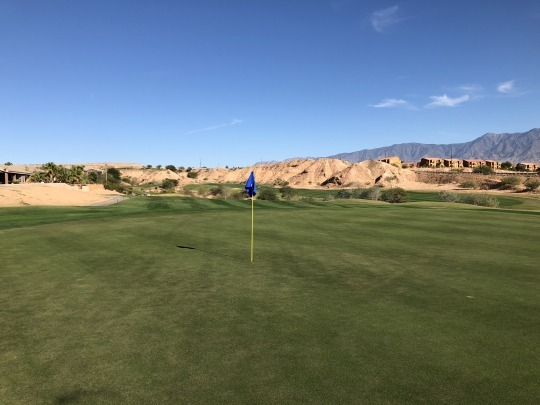 Oasis has two courses and I hadn’t played either of them prior to this trip. 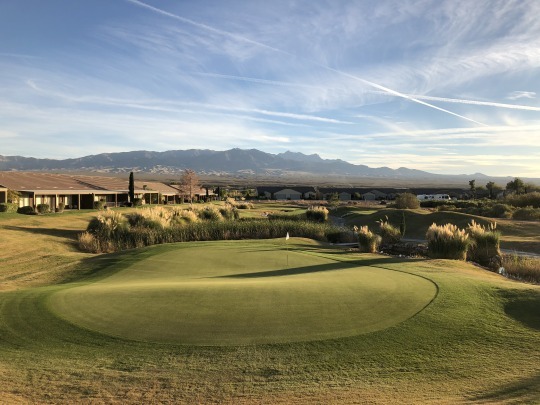 To me, they’ve always seemed a bit overpriced and deals aren’t usually easy to find like they are at the other comparable mid-level Mesquite courses (considering Wolf Creek as the one and only “top-level” course in town and the rest being quality B players). 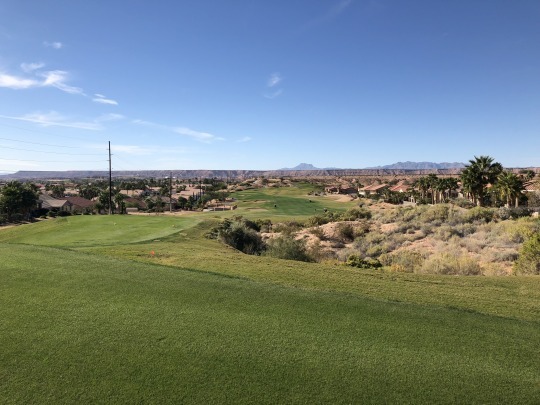 Fortunately, my friend was looking around awhile back and found an oddly inexpensive tee time for The Canyons Course at Oasis. It was only around $40, even though most everything else in town this time of year is quite expensive. We went ahead and booked the 9:30 time at that price. When he checked later, all times around us went up to $125. Not sure why that price was so low when we booked it, but we felt like we got away with something. The pro shop guys didn’t bat an eye when we checked in and paid the balance, however, so I guess it’s wasn’t that outrageous. We figured it would be busy there on a Saturday of a holiday weekend, but it really wasn’t. They sent us off as a twosome a little ahead of our tee time. We did catch up to other groups pretty quickly and waited on most holes, but the total pace was nice around four hours. 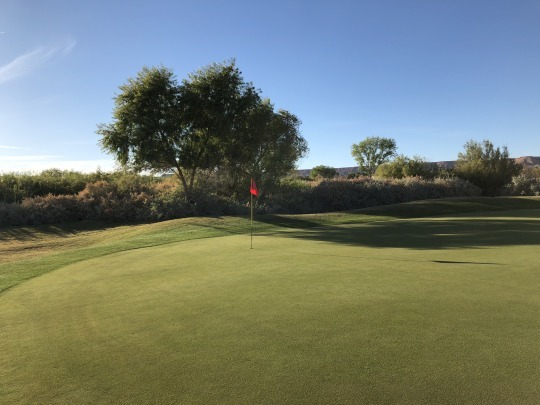 We were considering asking about a replay on The Palmer Course, but we heard them announcing a shotgun start over on that course as we were finishing on the 18th of ours. So that idea went quickly out the window, but we still made the most of our time as you’ll see later. 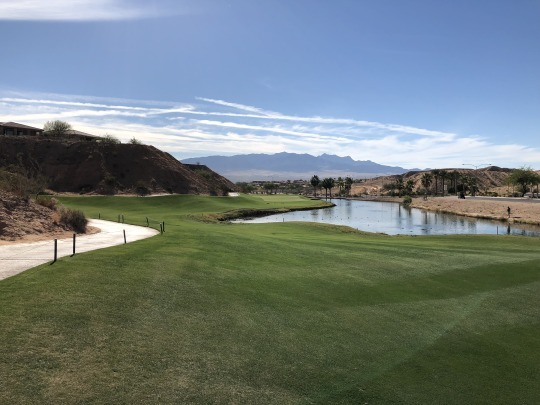 The Canyons Course was designed by Dave Druzisky. The setting is kind of weird as it works through some really cool canyon areas while also working through a residential community and some streets. 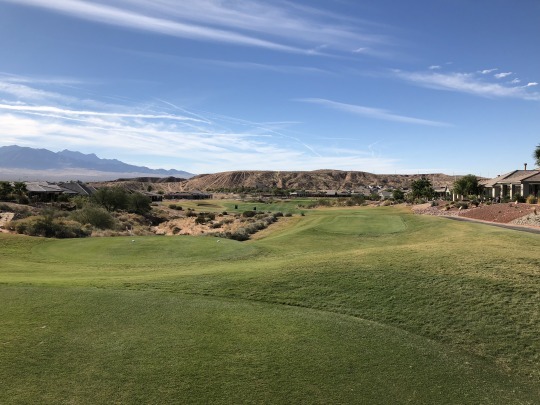 It seems a lot of holes would have a beautiful rugged canyon hillside on one side of the fairway and then houses or a street along the other. There is a lot of driving between some holes and you are often traveling along and across the streets. 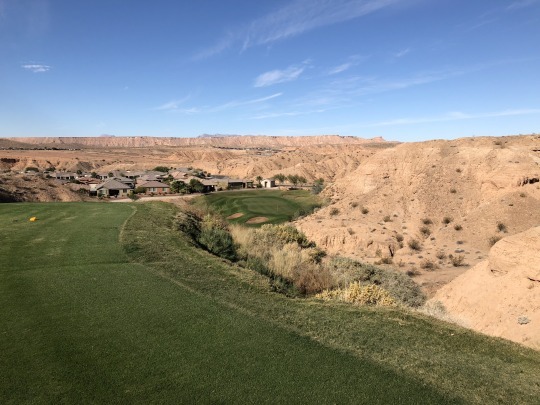 You definitely don’t get the “secluded” canyon setting here like you do at some of Mesquite’s other courses. The streets especially take away from the overall experience on this course. 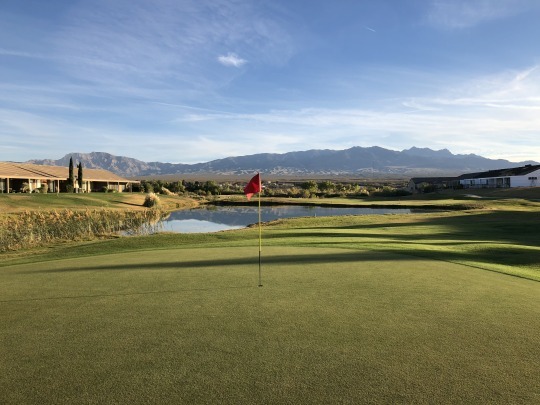 If you focus on just the layout, The Canyons Course offers an enjoyable design. The front nine is definitely more interesting with some good changes in elevation and fun holes like the tricky dogleg left par-4 6th. This hole plays around the corner of a rocky hillside and then water runs up the right side as you near the green. The back nine has a few memorable holes, but I found the front more engaging and distinctive overall. I will commend The Canyons Course for having a really strong collection of par-3s. All four offer something a little different. The 4th hole is probable the best of the bunch with a severely elevated tee and a nice view. 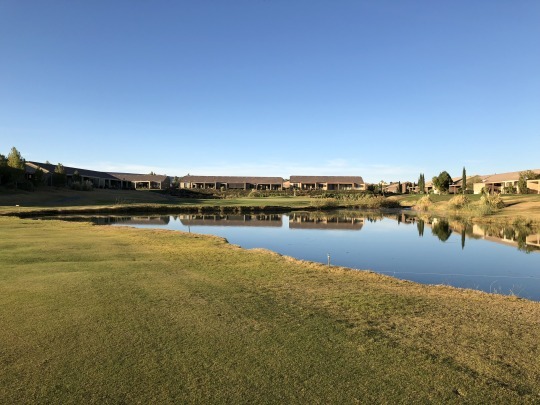 The 7th is more flat as you play over a large water hazard. The 9th is an odd one that I think I enjoyed much more than my friend. It also features a very elevated tee. A creek crosses back and forth on the way down to the hill and the green is guarded by kind of a moat that circles almost all the way around. It is an awkward and semi-blind tee shot from the back blue tees, but I found it to be a fun and challenging hole. Lastly, the 17th features another big drop from the tee to the green surrounded by the canyon walls. One of the more interesting moments on the course happens on the par-4 14th. It’s a very straightforward hole, but it is actually bisected by the Nevada/Arizona state line. It seemed we were close to the border when we got to this tee box, so I looked at a satellite map on my phone. At least according to that, the state line runs almost perfectly down the center of the fairway. 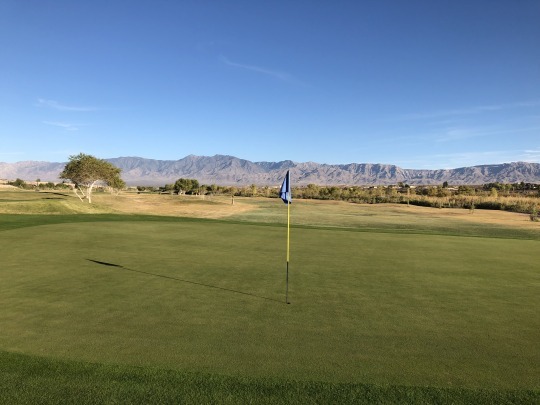 The hole was tucked on the left portion of the green (technically in AZ if the map is accurate). It was the first time I’ve ever had to putt across state lines and I got a real kick out of that! The course was in solid, albeit unspectacular, condition for this time of year. 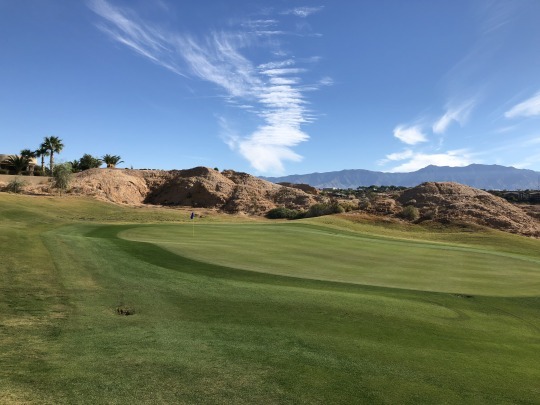 It’s about what I’ve come to expect in Southern Nevada on all but some of the more high-end courses. The tee boxes were fine. The fairways looked better from a distance than up close as the overseed didn’t completely fill in. It was kind of thin in some areas and fluffy in others, but mostly decent enough. The rough is semi-dormant bermuda. It was cut way down and easy to hit from. I was in one bunker and it was prototypical NV crunchy, coarse desert sand with some pebbles. The greens were in good shape. They were firm, yet receptive on well-struck shots, rolling smooth at medium/slow speeds. I really wish they were a bit faster, though. 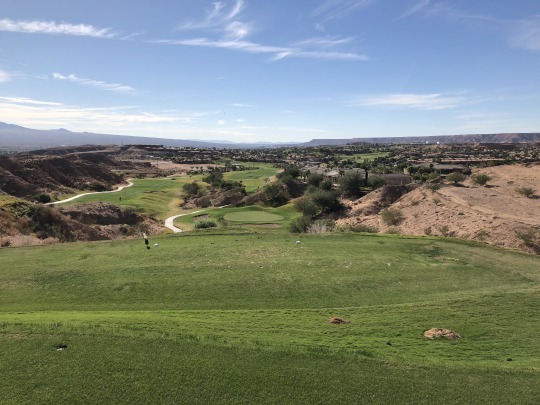 To me, The Canyons Course falls in a clear 4th place in Mesquite behind Wolf Creek, Conestoga and Falcon Ridge. 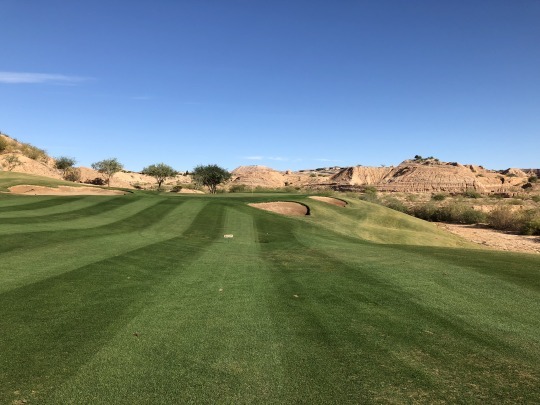 The only other courses I haven’t played in town are The Palmer Course and CasaBlanca, so I don’t know how it will rank when I finish up my Mesquite list (hopefully next year). If we hadn’t found such a good deal, I wouldn’t have enjoyed Oasis as much. However, for the price we paid it was a good experience. 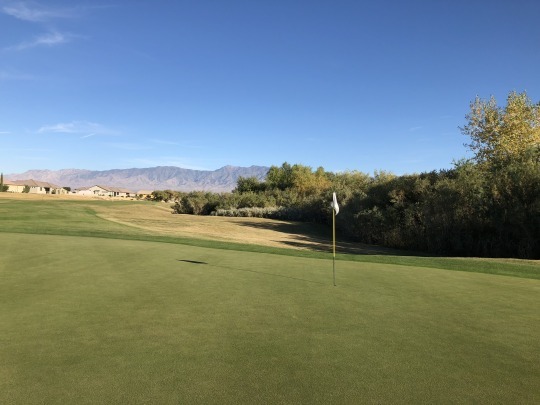 Just don’t set your expectations too high for conditions in Southern Nevada’s shoulder season. 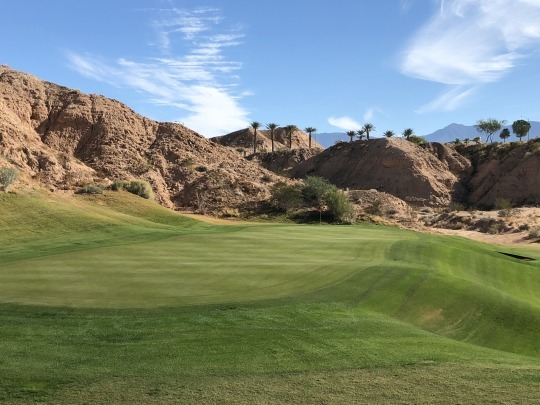 The prices go way up, but you won’t get Palm Springs like post-overseed conditions unless you play some of the upper-tier courses. We could see parts of Wolf Creek from Oasis and it looked incredible. That’s one I still want to go back and play again! 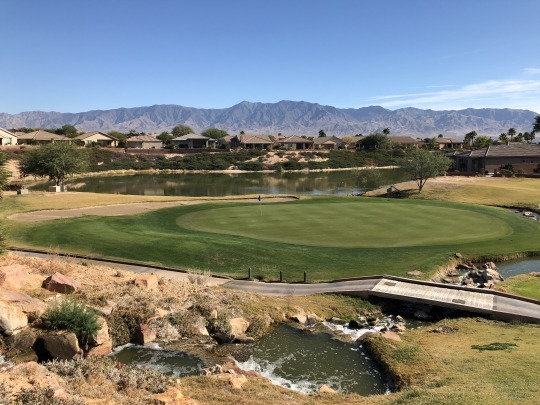 Coyote Willows is the course that not many people outside of Mesquite residents know about. 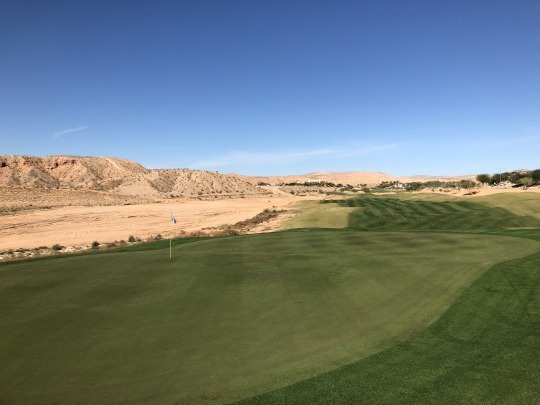 It’s understandable because it’s just a 9-hole course and it’s not meant to compete with the likes of Wolf Creek, Oasis or Conestoga. It really is just a locals course. 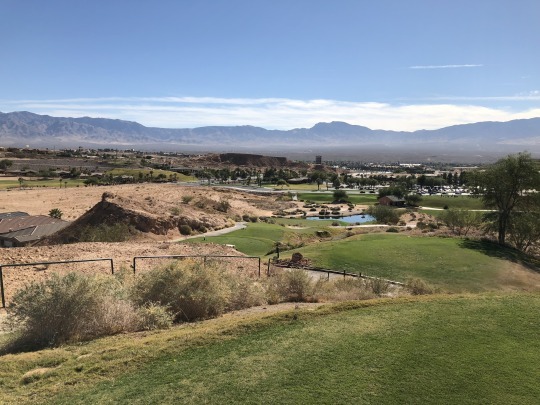 Still, I wanted to play it and check it off my Southern Nevada list. We headed over there and it wasn’t very busy at all when we arrived. We paid $25 to play 9 holes with a cart. 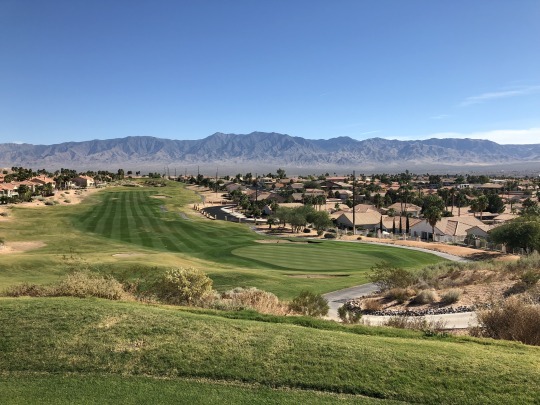 That’s certainly quite steep for what you get here, but I guess it’s technically a “value” in Mesquite this time of year when golf rates are really jacked up. 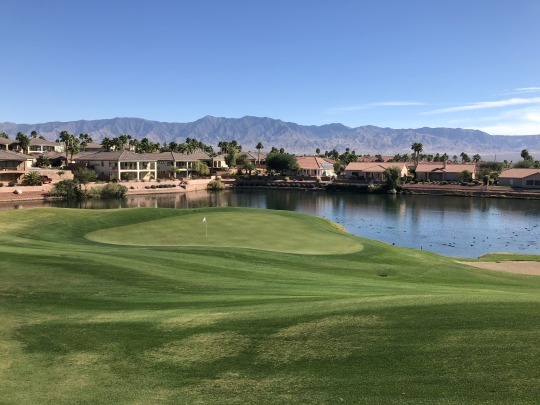 Coyote Willows is a par-35 regulation layout that seems like it has undergone some routing changes in recent years (and may still be in transition). 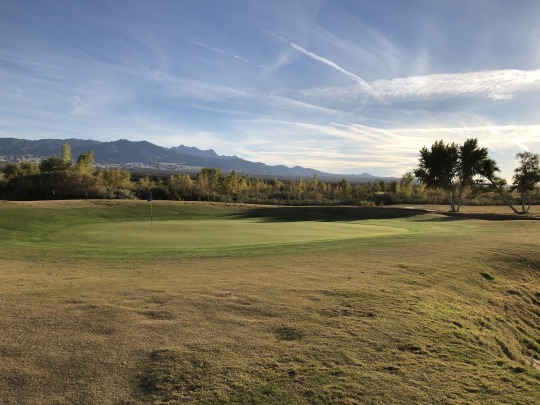 New owners just took over the course in September and their website says more renovations will be forthcoming. 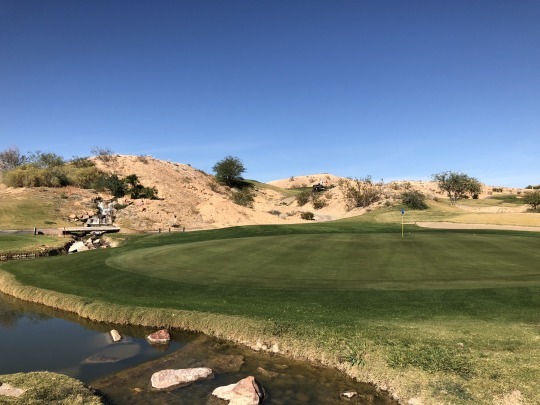 Some online sources show a scorecard with a total par of 32 for Coyote Willows, so it would appear some big changes have already taken place. Some of the signage throughout the course (mainly the rock signs on the tee boxes) are way off in terms of yardage, so those are best ignored for now. The terrain at Coyote Willows is very flat. 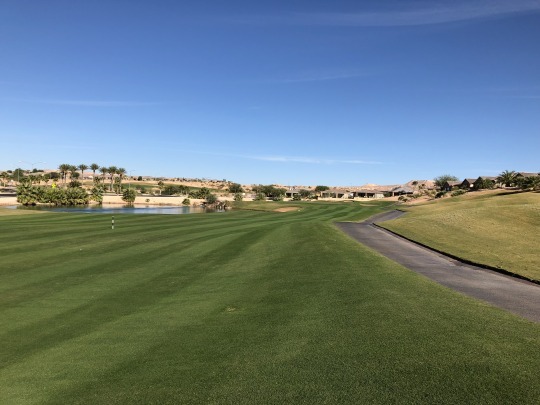 The course would seem like a good one to walk this time of year, but parts of the course are very spread out and it would be a pain, especially with a really long walk down the street between holes 2 and 3. 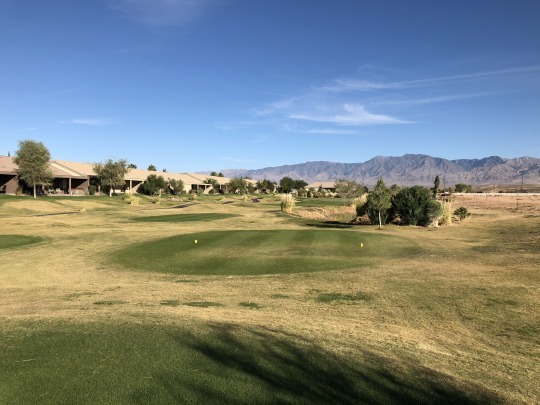 Overall, this course reminded me more of what I’ve played in Yuma rather than what I’ve experienced in Mesquite. It’s a pretty basic design surrounded by a few homes and some desert scrub brush and trees along the outer edges. 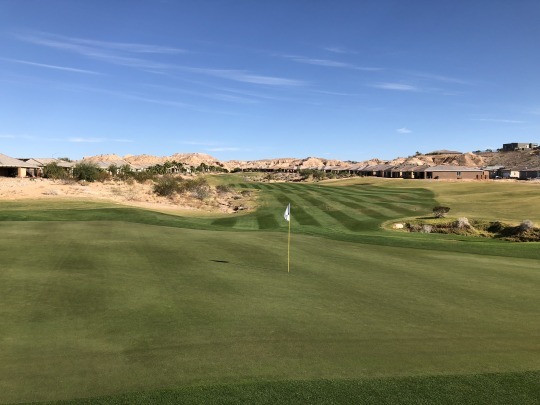 The holes are pretty wide open and very forgiving, and there’s not much visual definition from tee to green on most holes. Still, it’s a solid course and much better than I would have expected. 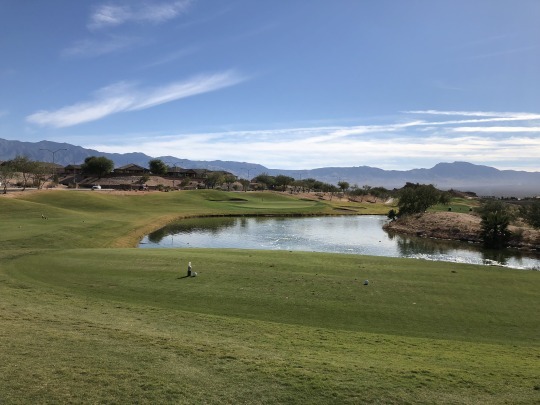 There are some water hazards in play and the setting is pleasant with sweeping desert vistas in every direction. The highlight holes here are the 8th and 9th. The 8th is a short par-4 with a ton of water in play. There’s a hazard that runs up the right side and then cuts across what is essentially a peninsula green. 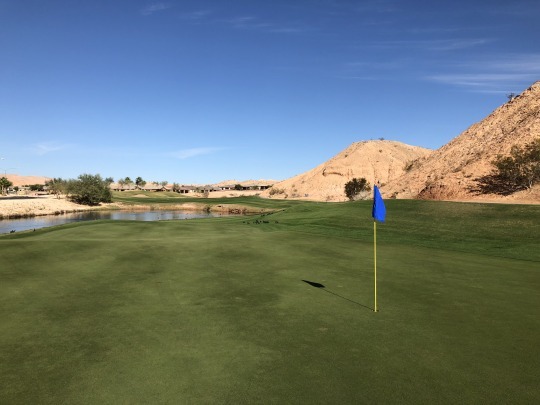 The drawings on the scorecard are crude at best and it’s hard to see what the hole does when standing on the tee, so be careful here if it’s your first time. If you can’t fly your drives 290+, then lay up! The 9th is a real treat as a finisher and it’s a par-3 unlike any other I can recall. 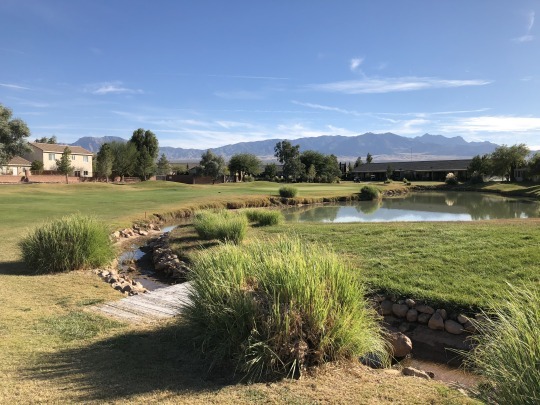 A small creek zig-zags back and forth all the way from the tee to the green and the forward tee boxes are interspersed amongst the curves. 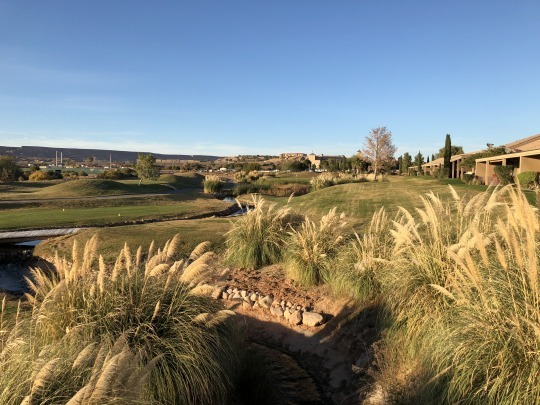 Some tall reeds and tall tufts of pampas grass line the water and make it a semi-blind shot to the green. The green itself is two-tiered with a large shelf in the middle and it is protected on all sides. I wish I had a drone with me to show the aerial view of the hole because the ground-level shots from the tees don’t really do it justice. The view from behind the green with the sun setting did turn out pretty sweet, though! 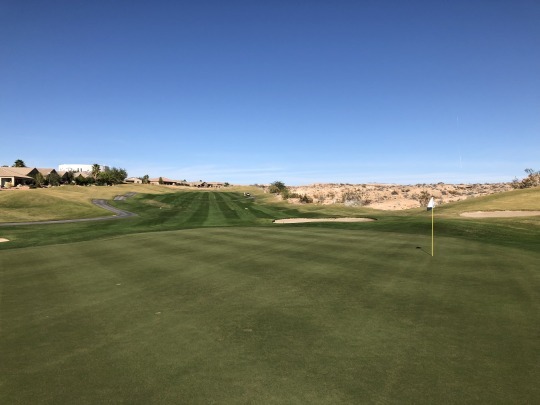 Coyote Willows was in okay shape for a course of this caliber. The tee boxes were a bit beat up, but okay enough. The fairways had been overseeded, but were still quite firm and thin. Some holes were nicer than others. 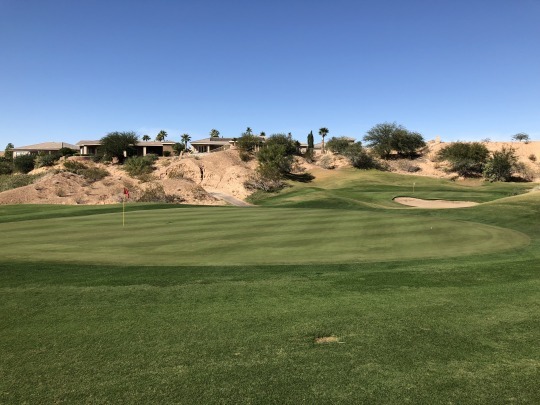 The rough was more of a hodge podge with mostly dormant, shaved-down rough, some dead hardpan spots and some more decent grass around the greens. I wasn’t in any bunkers. The greens were in good shape, though rolling at pretty slow speeds. 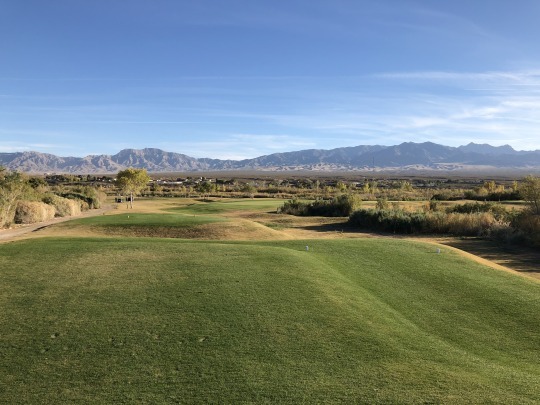 This is certainly not a destination course and it probably shouldn’t be in the plans for most people planning their Mesquite golf trips. 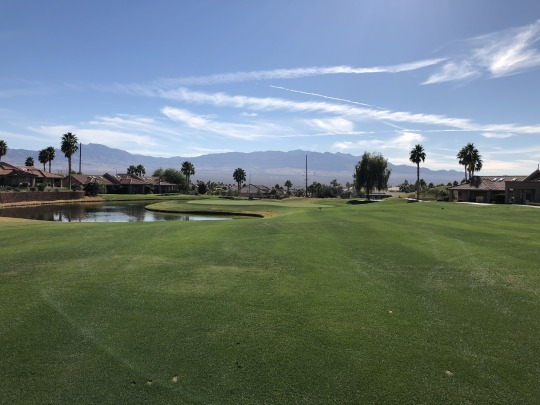 However, it’s a good course for locals to enjoy at a lower price and it’s not a bad one to throw in if you want to get an extra nine holes in. 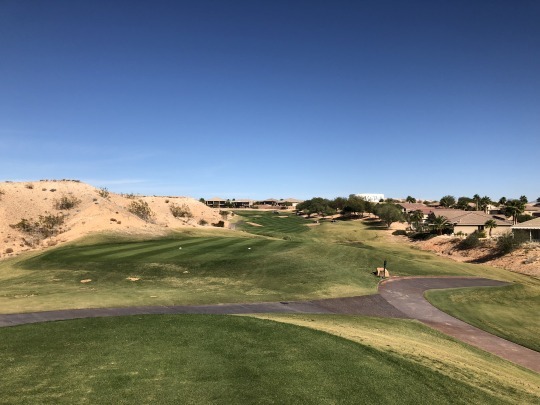 I love that they advertise themselves as “the best 9-hole course in Mesquite.” So what if they’re the only 9-hole course in Mesquite (unless you want to count Beaver Dam across the border in Arizona)!